Who says the rain has to keep us inside? While some rainy days may seem perfect for curling up on the couch with a good book or movie, your wide-eyed child staring longingly out the window is just itching to splash around - if only for a few minutes. In addition to keeping them warm and dry, you can find a variety of fun rain gear for kids designed to add color to dull, rainy days. Basic rain gear for kids consists of an umbrella, rain coat and rain boots. These days you can even find rain proof back packs. If you want to go beyond a traditional yellow rain coat like Coraline's, consider your child�s favorite colors and interests. Bright colors help a child stand out so you can see them better from your window. For children who may use the rain as a back drop for their play games, you may want to consider rain gear that will double as a costume, like astronaut or pirate themed. Animals and Insects - You don�t have to look too hard to find umbrellas designed in the shape of an animal or insect�s head or body. From lady bugs, bumble bees and butterflies, to cats, cows and puppies, your kid will stand out in a crowd and get a kick out of sporting his or her favorite. Amphibians&Reptiles � Nature-lovers will not forget to inform you that frogs, dolphins and alligators are far more likely to play in the rain than cats and butterflies. Bubble umbrellas � Few umbrella styles will keep your drier than a bubble umbrella. In windy rain, bubble umbrellas provide a layer of protection from the chill and they are less likely to pop inside-out. Plus, kids love pulling a bubble umbrella over their heads and feeling like they�re in their own little world - the ultimate in fun rain gear for kids. Firemen � The design of a fireman�s jacket lends itself to simple replication for a fun rain coat. Dinosaurs � With scaly spines poking out the back and bulging eyes on the hood, a wet dinosaur-child may be inclined to chase you. Beware. Monsters � Monster rain coats come in a variety of bright or ugly colors, and go especially well next to a sibling in a princess rain coat. Super Hero � The backs have extra material that bind to the arms, forming the shape of a cape or wings when the arms are spread. Can you imagine a more fun way to storm home from school than feeling like you�re Superman? Maryjane rain boots - This classic shiny black shoe with the single strap has finally been adapted for the rain boot. The length of the boot is designed to look like tights. Themes � If you�re going with costume-styled rain gear, like a bug or monster, you can find rain boots to match the look. Patterns � If you go with solid bright colors for the rain jacket and umbrella, you may want to consider a silly pattern for the rain boots. Colorful polka dots, stripes or flowers are popular with kids or you can find patterns with animals. 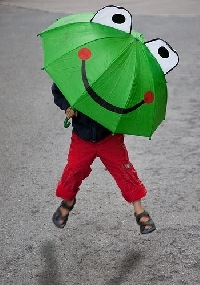 Fun rain gear is functional and it sparks kids� imaginations and encourages them to have fun in any situation: a welcome lesson on any rain day!